Xerox is working on a new algorithm that will be able to judge the aesthetic quality of photographs. The tool, which is currently under development is being showcased on Open Xerox, a website run by the company to show off its developments. At the moment, you can play with the image search tool using a variety of different pre-sets, but as yet you can't upload your own images to be judged by the algorithm. According to Xerox, the company is trying to "tackle the difficult task of trying to learn automatically what makes an image special, and makes photo enthusiasts as high quality." On the image search website, Xerox says "when searching for a photograph of a beach, you don't just want any old standard shot. You want a nice beach with lots of colours, a good composition and perfect exposure." While the algorithm is of course far from perfect - it's still in the alpha stages - exploring what it can do so far is interesting. Different categories currently in the search include "Clouds/Sky", "Boat", "Portrait" and "Waterfall" among others. In the "Clouds/Sky" category, the website says, "Very overcast skies where everything looks blue is an indication of poor quality." As the algorithm is in its early stages, Xerox is looking for feedback on the technology. 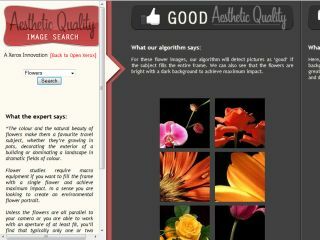 So if you think it's impossible for a computer to objectively assess aesthetic beauty, or you think it's a great idea - you can let Xerox know on the Open Xerox website.